astonish yourself, astound your friends. Easy to follow patterns guide you through the steps. See "How to cut 3-D Patterns". 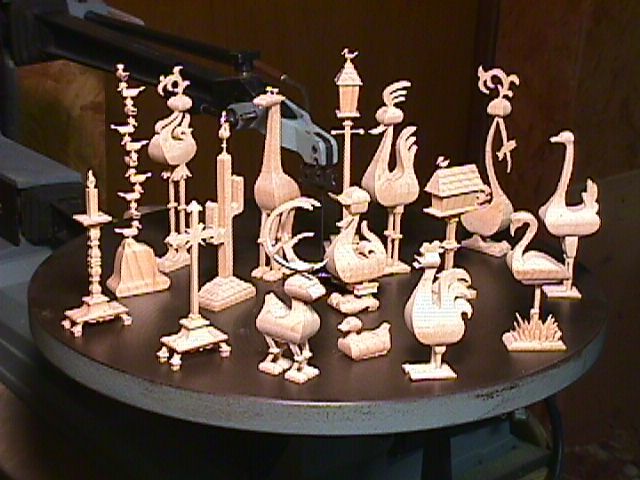 Pattern set includes deer, Christmas tree, duck hunter with decoys, cross, candlestick, roadrunner, flamingo, rooster, giraffe, ostrich, camel, cactus with roadrunner, lamppost, mailbox, silly bird, pelican, bird with fish, running men, stacked birds, chair, table. See "How to cut 3-D Chess Set". Two sizes, 2 5/8" and 4" high King patterns, with detailed instructions. emailed with instructions for opening and printing. We attempt to be as prompt as possible but, there are occasions when we are not online at the time you order and there may be a delay.